Adam and Eve 5 Zombies is an interesting arcade game, developed by FUNCTU.COM. This game has simple graphics, suitable for all ages, especially children and families. You can experience this game on your browser because it is a flash game. 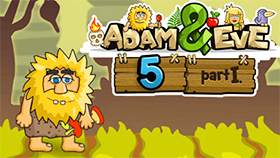 In this game you will control Adam and your task is to overcome the obstacles on the way to rescue Eve. Your enemies are zombie cats. This game has many levels, each level is a challenge for you. At each level, zombie cats will appear randomly and you have to find ways to defeat or escape them. If you are touched by zombie cats, you will lose. Note: Some level will require you to finish it with time pressure. You will have to click on any object on the game screen to find out how to defeat or escape zombie cats. At low levels, you will face a zombie cat. But at higher levels, you will face a lot of zombie cats. If you like this game, you can also play others games with the same game play such as ZOMBIE SOCIETY: DEAD DETECTIVE VS NINE DEATHS CAT, VORTEX POINT 6… or you can play other part of this game, namely Adam N Eve 4.